Peering into the "gut" of the galaxy Centaurus A, NASA's Spitzer Space Telescope has captured in unprecedented detail this massive galaxy's last big meal: a spiral galaxy twisted into a parallelogram-shaped structure of dust. The findings were presented today at the American Astronomical Society annual meeting in Denver, Colo. A stunning image of the galaxy and its bizarre dust structure is shown above. While previous observations with other telescopes have revealed this galactic remnant, it appeared as one long and irregular bar of dust. Spitzer's uniquely sensitive infrared eyes allowed the telescope to see clearly this strangely geometric structure for the first time. "Now we can actually see the shape of this structure, which helps us explain how it arose," said Dr. Jocelyn Keene, principal investigator for the new research and an astronomer at NASA's Jet Propulsion Laboratory and the California Institute of Technology, both in Pasadena, Calif. 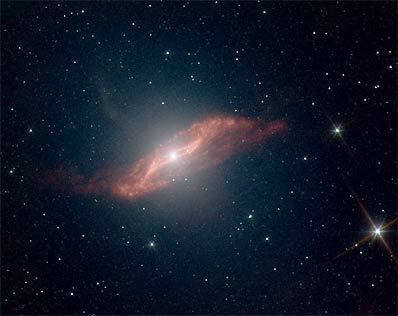 Located 10 million light-years away, Centaurus A is a type of galaxy known as "elliptical." It is one of the brightest sources of radio waves in the sky, which suggests the presence of a supermassive black hole at its center. About 200 million years ago, this galaxy is believed to have consumed a smaller spiral galaxy - the contents of which appear to be churning inside Centaurus A's core, triggering new generations of star birth. Resolving this unusual parallelogram structure has helped astronomers finally put together a picture of its history. The geometric shape can be explained using a model that describes a flat spiral galaxy falling into an elliptical galaxy and becoming twisted and warped in the process. The folds in the warped disc, when viewed nearly edge on, take on the appearance of a parallelogram. The model predicts that the leftover galaxy will ultimately flatten into a plane before being entirely devoured by Centaurus A. Warped discs like this are the "smoking guns" of galactic cannibalism, providing proof that one galaxy once made a meal of another. Such galactic feeding has long thought to be a mechanism by which giant elliptical galaxies form and grow, and likely provides the fuel that drives the strong radio activity surrounding Centaurus A's central black hole. Other authors of this research include Dr. Alice Quillen of the University of Rochester, N.Y., and Drs. Daniel Stern, Varoujan Gorjian, Karl Stapelfeldt, Charles Lawrence, Peter Eisenhardt and Michael Werner of JPL. Launched on August 25, 2003, from Cape Canaveral, Fla., the Spitzer Space Telescope is the fourth of NASA's Great Observatories. This program includes the Hubble Space Telescope, Chandra X-ray Observatory and Compton Gamma Ray Observatory. JPL manages the Spitzer Space Telescope mission for NASA's Office of Space Science, Washington. Science operations are conducted at the Spitzer Science Center. The California Institute of Technology manages JPL.